Version 2.2 released for Windows 10 and Android FREE! We recommend installing from one of the app stores above. However, if you are accessing this page from your Android device, you can also install directly from our website by clicking on the link below. To install from this link you will have to allow your Android device to "Install from unknown sources". This option is usually found on the "Settings, Lock Screen and Security" page in Android. However if this is set to disallow unknown sources, you will usually be able to accept "Just this app" when you install it. The WifiTrax Loco Operator App runs on Windows 10 and Andoid (4.4 and above) and is available for free download from the Microsoft App Store (Windows) or the Android Play Store for Android. An IOS version for IPhone and IPad is planned within a year. 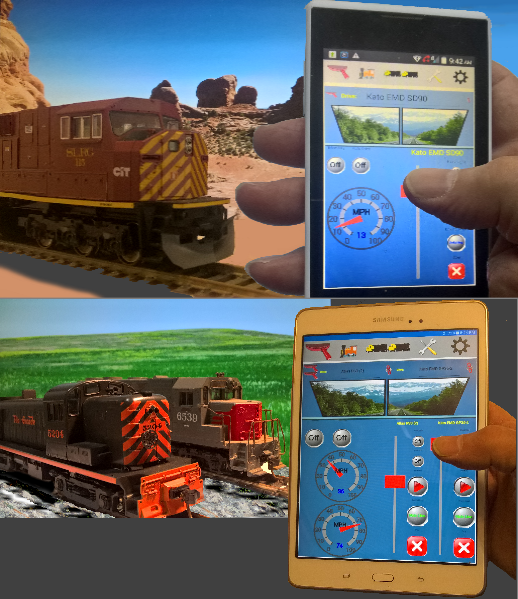 Loco Operator contains all the functions you need to manage and operate all the WifiTrax equiped locomotives on your railroad. Loco Operator 3 Beta 1 is also available for download using the link below. THIS IS BETA SOFTWARE FOR TESTERS ONLY! To install from this link you will have to allow your Android device to "Install from unknown sources". This option is usually found on the "Settings, Lock Screen and Security" page in Android. However if this is set to disallow unknown sources, you will usually be able to accept "Just this app" when you install it. To find out more about beta testing please email wifitrax@steveshrimpton.com. Organize two or more locomotives into Consists. Tune the individual locos in the consist. Consists appear for selection on the Drive page just like a single locomotive. View telemetry from your locomotive and tune its control parameters. Often the loco will run fine on the default factory settings but you can often improve. Also you will want to give each locomotive a name. Adjust the settings such as the network information, miles/kilometers, etc. Android 4.4 and above, on Android Phone or Tablet. There are many versions of Android and we can't test them all, so it's a good idea to download and try the App before you buy one of our modules! We don't yet support IOS, but we probably will fairly soon.